DD5LP/P – April 8th. 2017 – DL/AM-180 Berndorfer Buchet. This activation would not earn me any new activator points as I have already activated this summit in 2017. It is however the closest to me at about 35 minutes drive from home. The day before after discussions with Karl M3FEH, who was planning to go out, I decided to go out early this Saturday morning as well. The main aim was to see if indeed a long path contact into VK or ZL was possible on 40 metres as 20 metres has not been performing so well in the last weeks. Also with an SFI of about 118 and K index of 1 – conditions should be good, right? No – in fact from Friday to Saturday the SFI dropped to 66 – the lowest it had been for several years and the K Index rose to 3, sometimes 4. I didn’t know this was going to happen of course and only found out after returning home, making what was achieved even more interesting. No experiments with equipment – the FT-817ND plus amplifier and the 6m portable mast to support the Aerial-51 OCF dipole were prepared for the early start. The OCF having the advantage of covering both 20 & 40m. My sun umbrella support was also put with the two equipment bags and all was set. 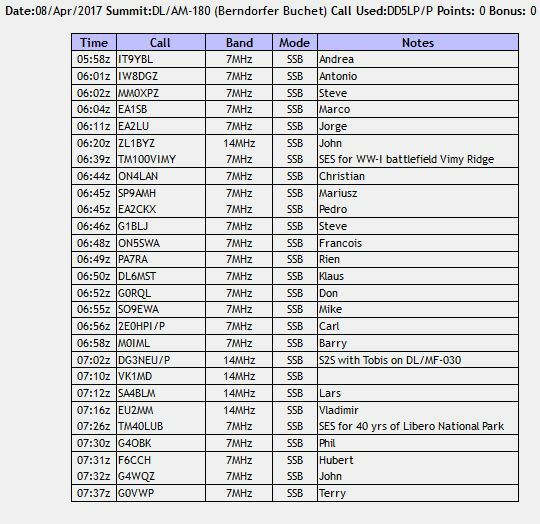 As mentioned above Berndorfer Buchet is the closest SOTA summit to my home QTH. It is on a hill above the village of Pähl south of the Ammersee lake in southern Bavaria. As you will see from the photos, the summit is completely wooded, which is not the best situation as they de-tune antennas (especially vertical), but I have made contacts into VK from here before, albeit when radio conditions were somewhat better than they are at present. An early start – away before 7am local time (now 0500 UTC) and a clear run down the country roads across country to the summit. I was half expecting to see snow as I approach the summit however there was (thankfully) none to be seen. What I did see however was the sun rising through the early morning mist – it looked like a large orange ball. If I hadn’t been driving at the time I would have taken a photo of it – it was impressive. The weather wasn’t bad but the temperature was down at 0.5°C and stayed that way for a couple of hours until the sun burnt through all of the mist. The set-up of the mast, as you’ll see from one of the pictures ended up as a combination of a “natural” support and the sun umbrella base. The antenna went up without any major problems and the station got set up on the painters sheet on the ground. I started by tuning around 40 metres and indeed I coul hear some VK fixed stations in conversation as well as some US stations. But in the couple of opportunities I took to call them, I got no response, being flattened by far more powerful stations with larger antenna systems I expect. After self-spotting, I got some european chasers but they were not as strong as normal. I suspect the skip distance on 40m was long at this time (just after 0600 UTC). I gave 20m a try and was rewarded with a call from John, ZL1BYZ but this was a difficult contact – especially from John’s end. Without John great antenna systems, I don’t think this would have been possible. Certainly an S2S with VK/ZL on 20m would not have been possible today. Later when I found out that the SFI had dropped so far, it was no surprise that contacts were difficult on 20m. The purpose of the activation was to check out 40m for DX so I switched back to that band and did some “search and pounce” operations, getting a few more contacts including the TM100VIMY special event station. Following that there was a run of the usual chasers and the conditions on 40m continued to improve on 40 metres for inter-Europe contacts (so the skip was getting shorter I think), these stations were still not as strong as usual, but better than earlier. One more trip to 20 metres was rewarded with VK1MD calling me along with a few European chasers. At this point I replaced the battery on the amplifier which had drained without the monitoring device saying anything – it showed down to about 90% and then simply stopped working (all 4 cells were actually at 0% as I found out when I got home). One final run on 40m, which was now back to european stations only, no NA or VK DX and then it was time to pack up and head back to the car. All in all a good test. I could hear the VK stations on 40 metres at between 5-5 and 5-8. One was actually working portable with a dipole but admittedly running 300 watts, while another home station, again with a wire antenna was running just 95 watts. I think given possibly 50-100W and ideally a better antenna than a dipole, arranged S2S contacts between EU – VK and EU-NA early morning (EU time) would be possible. So as we continue down to Solar minimum perhaps we need to look to larger stations with more power on 40 metres for long path contacts to VK/ZL? Unfortunately, although I saw Karl M3FEH spotted on SOTAWatch, I didn’t manage to hear him from this activation. Aerial-51 OCF horizontal wire dipole UL-04. I have replaced the LIPO monitor unit with a second one that I have – unfortunately, this one doesn’t have such a big display but perhaps it will be more accurate! I think 40m EU-VK S2S contacts will be possible if both ends can run more power. As this will involve heavier gear and batteries, this would perhaps need to be an activation with more than one person and larger flatter summits would probably make things easier to install that small high peaks.